Following the success of the ‘On The Edge’ music event as part of Artsmile in August we are looking forward to this new music series. 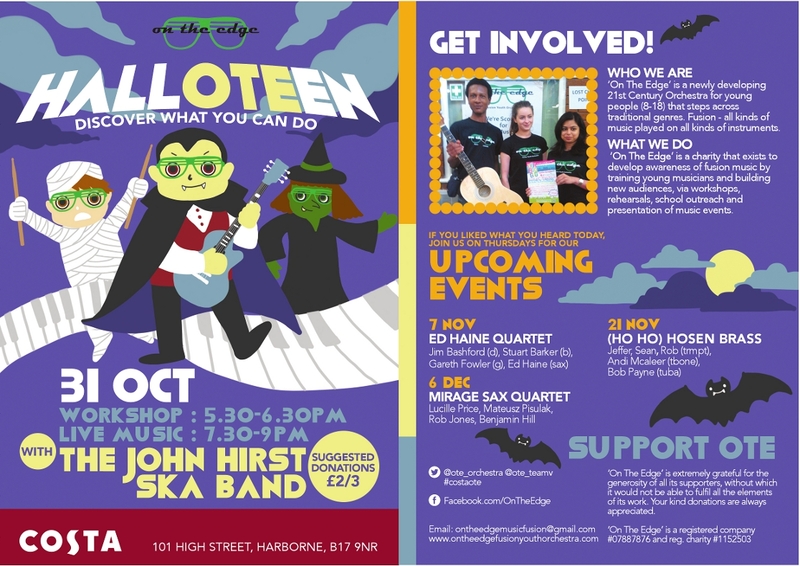 Kicking off for Halloween, drummer John Hirst brings a ska act to COSTA coffee. Whether you’re a young musician wanting to get to grips with a new technique, wanting to try out a different instrument or just seeking some guidance, we’d like to welcome you to the workshops. Each member of the visiting bands will be on hand for an hour workshop between 5.30 and 6.30pm. More details to follow, or email us at ontheedgemusicfusion@gmail.com to ensure a place in the workshop/s. For all attendees, musician or not, COSTA coffee will stay open later on Thursday evenings for a live band performance. There are a range of live acts from October to December with plenty of chances to get into the holiday spirit over a speciality coffee. While the acts are free, we would really appreciate your donations so that we can do more in the future. Look forward to seeing you at either a workshop, a performance or both.